What are you worried about today? That you’ll never feel normal again? That your spouse will be widowed? That your children will grow up without you? That this next holiday may be your last? You may even be worried that you worry so much! Holocaust survivor Corrie ten Boom once wrote “Worrying about tomorrow robs today of its joy.” That is so true. Your mind will find peace when you can live in the present and not the “what-ifs” of the future. People often suggest that those dealing with serious/chronic illness take life “one day at a time,” but there may be some days when you can only face one hour or one minute at a time! When you hear the phrase “what if?” pop into your mind, that’s a signal you’re not living in the present and probably are getting ready to worry. 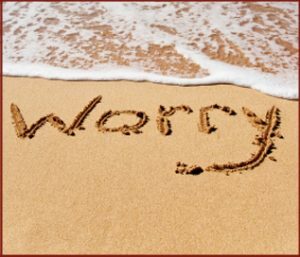 And if worry seems to be a chronic problem for you, please check the condition of your “soil.” Jesus says our hearts are like soil and His truth is like a seed planted there (Mark 4:1-10, 13-20). Sometimes our soil is so rocky that when problems come along–like illness–our love for God grows weak. Other times our soil is so thorny that all the worries–health, financial and otherwise–choke out our closeness with God. So you are the right kind of “dirt”? How open is your heart to God? Is you soil ready to receive whatever truth He has for you? What a great, short verse to memorize and meditate on instead of any what-ifs. As you trust in God’s promises, I believe He will pour His own brand of “miracle grow” on your life and in spite of whatever you face, you will produce good fruit! Today’s music video is a little different than what I usually post, but I thought the story behind the song–a friend diagnosed with breast cancer inspired it–was really cool. I’ve posted the lyrics here because they aren’t on the video–but if you watch long enough, the friend with cancer is! “Pray and Don’t Worry” by the group GI (also known as God’s Image). Cause worrying only makes you feel as if you can’t win!!! Push me out the boat and I’ll walk on water!